That does not mean root and branch reform based on a premise that the Council is fundamentally failing. It is not. Rather, it means pursuing evidence-based improvements in a number of specific areas where the experience of the past twelve years suggests the Council could do better. Examples of such areas include: 1) working methods; 2) the agenda and the programme of work; 3) the effective delivery of capacity-building and technical support; 4) membership – in particular supporting inclusivity and accessibility for a more diverse membership, and improved compliance with the principles and criteria set down in GA resolution 60/251; 5) support for domestic implementation; 6) strengthening coordination and communication between ‘Geneva’ and ‘New York’; and 7) securing a shift in how the Council considers and deals with situations of human rights violations – from reaction to prevention. Calls for, and debates around, Council strengthening have steadily increased over the past two years. There appears to be broad agreement on the need for a process of reflection and review with a view to improving the functioning of the Council even further. Today, the key difference between States is not over whether there is a need to bring improvements to the work of the Council, but rather how and when to proceed in that effort and what improvements are needed. 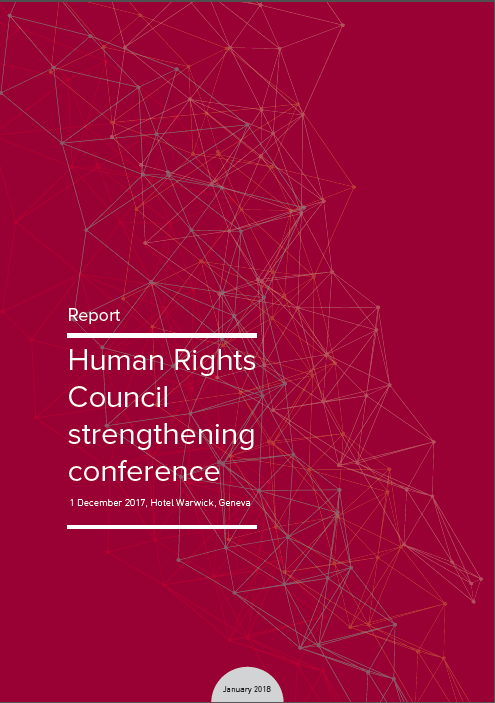 Against this background, the Netherlands, the United Kingdom, Mexico, Japan and Latvia, supported by the Universal Rights Group, organised, on 1st December 2017, a one day conference designed to provide an open platform for States to exchange views on the question of Human Rights Council strengthening. This outcome document report aims to capture the spirit and substance of those discussions, to reflect all views put forward, while respecting the ‘Chatham House Rule’ format of the discussion. The report is not an exhaustive summary of all the discussions, focusing instead on the main outcomes. The report does not take a position on the ideas put forward, nor does it provide suggestions on the process for taking any of these ideas forward. The report is intended to be a reference document for future discussions on the strengthening of the Human Rights Council.